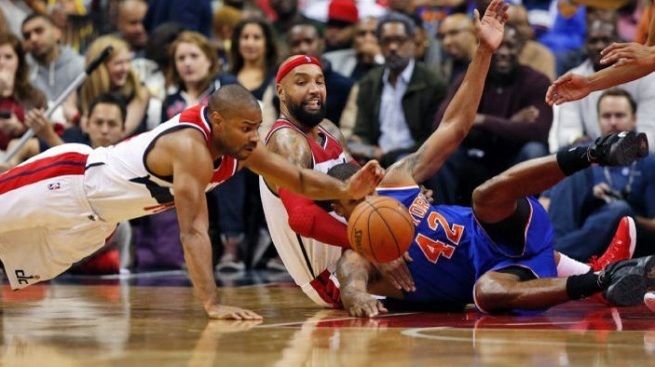 Wizards guard Gary Neal dives for the loose ball with forward Drew Gooden and Knicks forward Lance Thomas (42) on the floor in the second half. Carmelo Anthony scored 37 points and the New York Knicks ruined Washington's home opener, beating the Wizards 117-110 on Saturday night. Anthony hit a jumper with 1:35 to play to give New York a 108-106 lead. Langston Galloway added a 3-pointer with 1:03 left to make it 111-106. With the Wizards trailing 111-110 with 21.5 seconds to play, Galloway was able to call a timeout in front of his bench with Otto Porter grappling with him for the ball. Anthony added two free throws with 20.4 seconds to play for a 113-110 lead. Washington failed to start a season 3-0 for the first time since 2005-06.